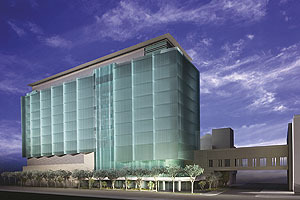 The new Center for Biomedical Discovery, shown here in an artist’s rendering, will be home to researchers who will work at the interface between basic science and medicine. The researchers will focus on translational research programs in children’s health, cancer, pulmonary edema and other medical specialties. The University broke ground on Monday, Oct. 17, for a new state-of-the-art home for translational research programs in children’s health, cancer, pulmonary edema and other medical specialties. Scheduled to open in 2008, the future 330,760-square-foot, 10-story, blue-green, glass-walled Center for Biomedical Discovery will sit on the east side of Drexel Avenue between 56th and 57th streets. The facility will provide the missing link in a chain of recent building projects at the University and its Hospitals, connecting to the Center for Integrative Science and to the research and medical care of the University of Chicago Comer Children’s Hospital, which opened in February. Researchers in the Center for Biomedical Discovery will work at the interface between basic science and medicine. They will translate the sorts of fundamental scientific discoveries made by the biologists, chemists and physicists in the Center for Integrative Science into better care for patients, including those in Comer Children’s Hospital. The first of its kind in the country, the institute “will harness the insights of the biomedical revolution and apply them to the care of sick children,” said Goldstein. “It is dedicated to improving children’s health through organized, team-based research on how genes influence disease.” IMPS researchers will work with faculty all across the University to understand the causes of disease, identify why some children develop diseases while others do not, determine why treatments work for some but not others, and help prevent childhood diseases. One entire floor of the Center for Biomedical Discovery, about 30,000 gross-square-feet, will be devoted to cancer research with particular emphasis on understanding metastasis, the process by which cancers spread from the original tumor to distant sites. “We can frequently eradicate a primary tumor or regional disease with surgery or precisely targeted radiation,” said Ralph Weichselbaum, the Daniel K. Ludwig Professor and Chairman of Radiology & Cellular Oncology, “but the most frequent cause of death is metastasis, cancer cells that split off from the primary and then lodge in distant sites, where they spawn multiple new cancers. Another research group that will move to the Center for Biomedical Discovery is a team of 12 principal investigators who came to Chicago earlier this year from Johns Hopkins University. Led by Joe “Skip” Garcia, the Lowell T. Coggeshall Professor and Chairman of Medicine, this is the leading group in the world in the study of vascular “leak,” in which blood vessels become porous. Leaky vessels allow blood cells and fluids to escape into surrounding tissues, especially the lungs, under certain kinds of stress. This can cause inflammation, loss of function and extensive tissue damage. The CBD, designed by the award-winning Zimmer Gunsul Frasca Partnership of Los Angeles, Calif., was engineered to provide open, efficient and flexible spaces for laboratories and offices, and to encourage contact and cooperation within each lab and between different lab groups. In addition to the research spaces, it will feature a garden courtyard, conference and lecture halls, and several multi-story public and common spaces to enhance the exchange of ideas between researchers working on different floors in the building. This firm has extensive experience in the design of research and educational facilities, including several buildings at Johns Hopkins and Duke universities, and other academic medical centers. The CBD will connect via third-level bridges located south of the Center for Integrative Science and east of the Donnelley Biological Sciences Learning Center—the primary teaching facility for medical students and home to the Jules Knapp Research Center, which houses laboratories focused on genetics, cancer, immunology and neurobiology. The design combines a limestone, neo-gothic base, reflecting the campus heritage, with an open, airy feel of glass-curtain walls higher up. To lighten the visual impact, the architects varied the shape, glass designs and textures to emphasize the building’s open, translucent qualities rather than its height. The serrated west wall, for example, gives each office a view north to the central part of the city, as well as west over Washington Park. Researchers from IMPS and the Garcia lab are currently housed in the Center for Integrative Science and in the former children’s hospital. They will move to the CBD when it opens in 2008.